Rule your own kingdom in this RPG inspired by the classics of the genre. What is it? An RPG based on a tabletop game. If you’re familiar with classic Infinity Engine RPGs, playing Kingmaker is like slipping into a familiar old pair of adventuring boots. The muscle memory I developed playing Baldur’s Gate for hundreds of hours came straight back to me: backspace to select the whole party, R to rest, space to pause combat, holding tab to highlight all the interactive objects in a room. The game wears its influences proudly on its wizard’s sleeve, and even has Planescape: Torment's Chris Avellone on writing duty—but what Kickstarter-funded RPG doesn’t these days? The game begins with a band of misfit adventurers and mercenaries, yourself included, being challenged to conquer and name themselves baron of a disputed territory called the Stolen Lands. The story gets deeper over time, with warring factions and political intrigue complicating things, but you will eventually reach the point where you can construct and manage your own barony. Other than that, this is as comfortingly paint-by-numbers as computer role-playing games get, with monsters to slay, dungeons to crawl, towns to explore, and mountains of descriptive dialogue to click through. Kingmaker is based on Pathfinder, a tabletop RPG released in 2009 as a response to divisive changes to Dungeons & Dragons’ 4th edition. This means the real-time with dynamic pause combat, like Baldur’s Gate and its ilk, is based around rolls of a virtual 20-sided dice. On lower difficulties you can almost play it like a real-time strategy game, pointing and clicking your way to victory, rarely pausing. But nudge the difficulty setting just a notch higher and careful, strategic use of abilities and spells is essential—often unforgivingly so. This is a brutally difficult game in places, to the point of feeling unbalanced, which developer Owlcat is addressing with a barrage of hotfixes and patches. And yes, there are companions too, each with their own personality, motivation, and alignment to consider. Amiri is a chaotic neutral barbarian who screams “Blood for Gorum!” as she charges into battle: a deity she believes imbues the steel of her sword. Linzi is a chirpy chaotic good bard who chronicles your adventures in a journal. Jaethal is a neutral evil undead elf with an understandably morbid attitude towards mortality. And, naturally, if your actions conflict with any of the eleven available companions’ personal beliefs or alignments, they’ll confront you about it or leave the party altogether. When you create a character you choose their alignment, but it can change depending on the choices you make. You can start out neutral, but shift to good or evil if you behave a certain way. And your alignment also links to speech checks, revealing or hiding certain responses based on your moral stance. There’s a lot of nuance to the conversation system, and as you might expect, this is a game where you spend a lot of time talking to people—from idle chats with townsfolk to life-or-death situations. In the prologue you’re accused of several misdeeds and have to defend your actions: a nicely constructed demonstration of how people will respond to you based on their alignment. Similar to Obsidian’s Pillars of Eternity, some of the story takes place on the pages of a book. These little interactive fiction interludes are well written and illustrated, and a way for the writers to show you things beyond what the game’s regular top-down perspective will allow. These also incorporate checks for your party’s various skills—athletics, diplomacy, perception, and so on—which can dramatically alter the course of the story. The writing in the game is, in general, solid and full of character, but a little flat compared to the beautifully rich, evocative prose seen in genre mates such as Pillars or Torment—which are, admittedly, hard acts for any RPG developer to follow. As for managing your barony, you can be as hands-on as you like. It’s possible to simulate this part of the game entirely, but do it manually and there’s a hell of a lot to get involved in. You can give your companions jobs, and their alignment will dictate how they approach the role. You can draft trade agreements with other towns, or even pillage them, giving your barony an appropriately bad reputation. You can construct and place buildings in villages including granaries, taverns, and watchtowers, all of which generate money for you. Granted, it doesn’t have the depth of a full-on management sim, but it does set Kingmaker apart from other games in the genre. There’s a lot to like in Kingmaker, and it’s clear the dev has a passion for this classic era of PC role-playing—which, in the case of its often absurd level of difficulty, isn’t always a good thing. But it hasn’t grabbed me as firmly as those games, or recent examples of the genre’s resurgence such as Divinity: Original Sin or Pillars of Eternity. The story, visual design, and setting offer little I haven’t seen in a dozen other fantasy games, and I wasn’t as beguiled by it as much as I’d hoped. 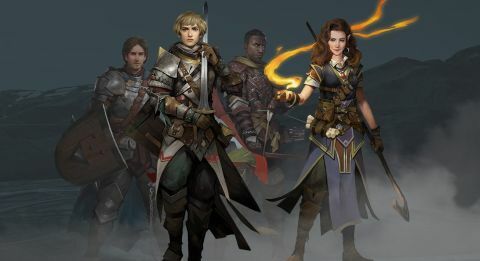 Once upon a time a good CRPG was hard to find, but now we’re slightly spoiled for choice and Kingmaker doesn’t quite stack up with the best, even if it does get a lot right and throws a few neat new ideas into the mix.